Looking to the west again this am are the mountains with fresh snow and clouds lifting off of them. 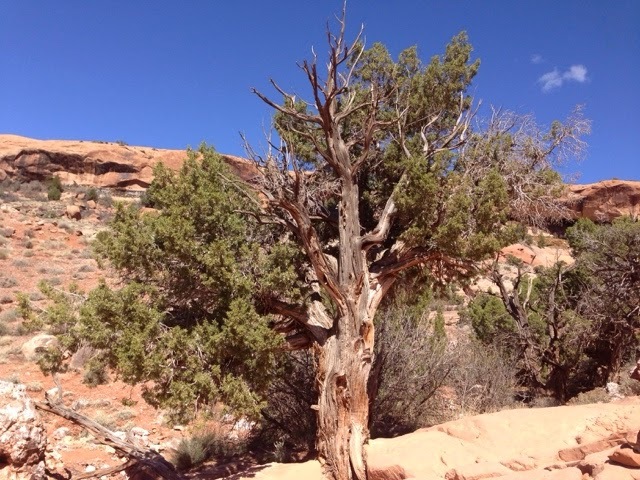 I decided today to go to Arches National Park Utah. 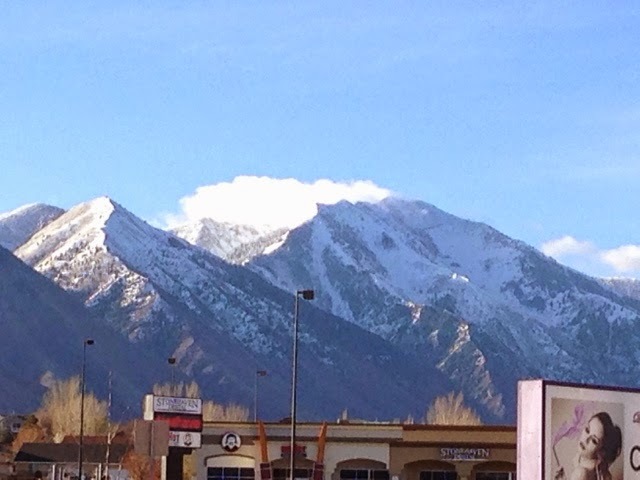 It is south and east from Salt Lake City, not far from the Colorado boarder. 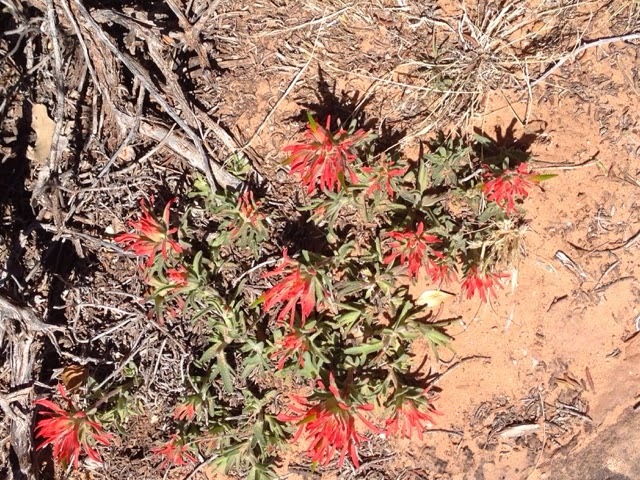 Today was a long day with a lot of scenery in the park and more than I can cover in one blog posting. Therefore, here is Part 1. 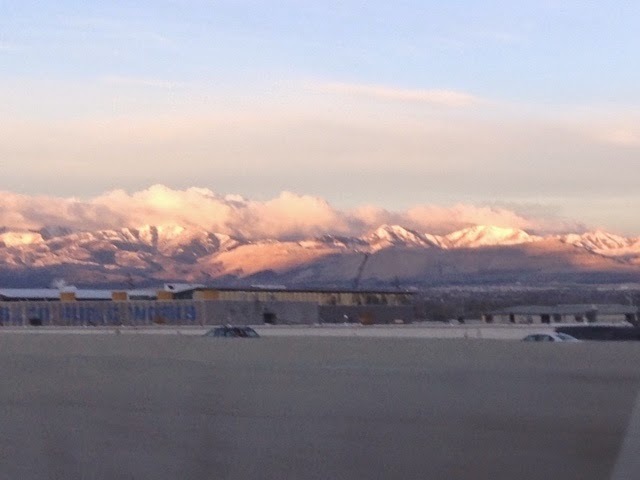 This is the view from US 6 as I leave I 15. This section of US 6 brought me by the scene of a deadly accident that happened yesterday. It was adjacent to the railroad tracks and good thing a train was not coming by as it looked like the accident could have been involved. 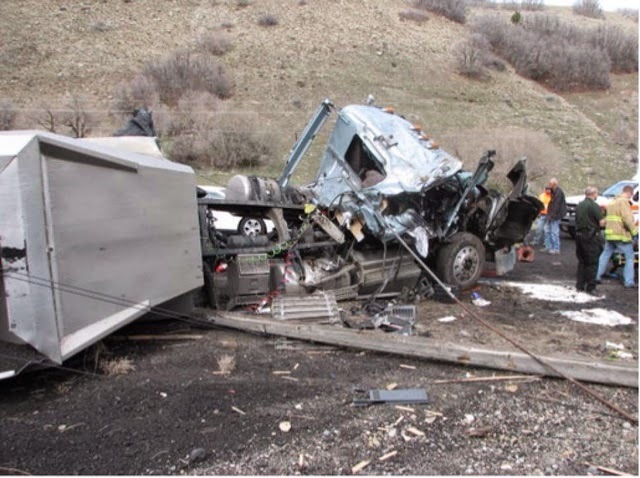 An SUV crossed the center line and hit at Trailer truck hauling coal that lost control and rolled over spilling the contents. 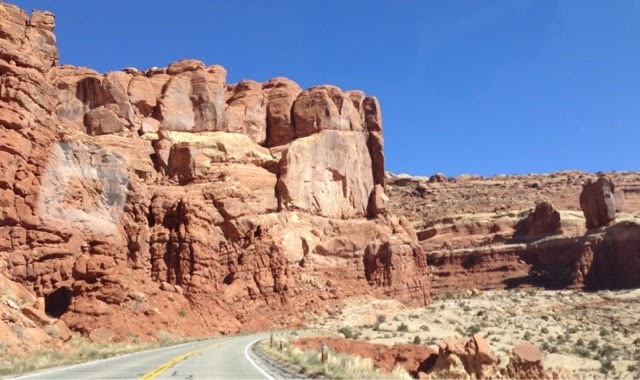 My drive was over 250 miles to get to Arches NP. As you know by now I like to drive. I am just shy now of having driven 12000 miles on my 2015 Travels. Like many of the miles I drive out here I drive on long straight roads, but I have my podcasts I downloaded the the Spanish Junction, UT McDonalds to pass my time. 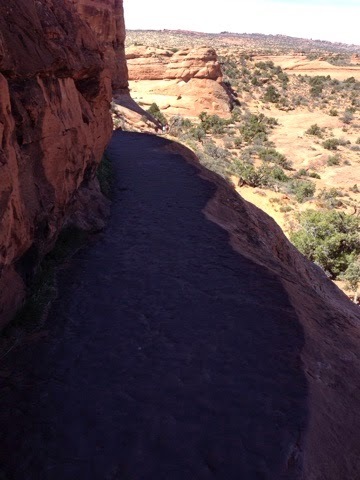 I arrive at Arches National Park about noon and I show my pass and I quickly ascend the switchback road into the park bypassing the Visitor Center as I now only have the afternoon to see the park. 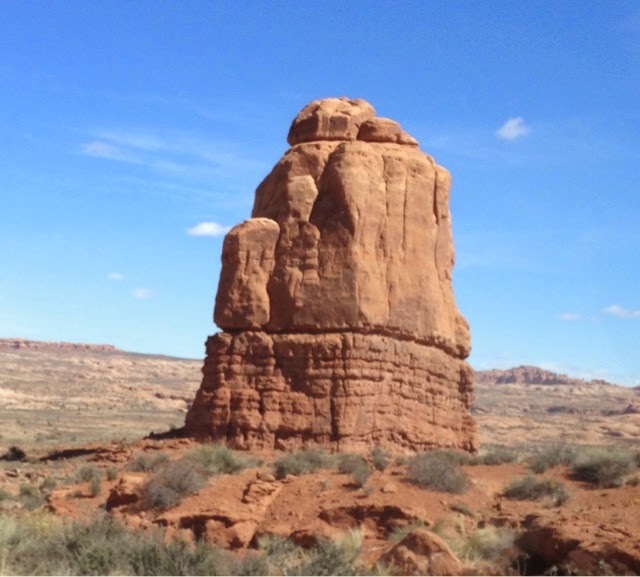 There are many rock formations to look at. 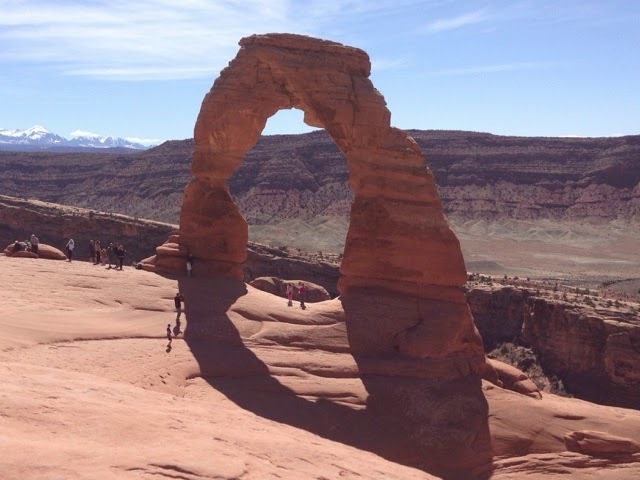 My goal is to go to one of the more popular arches first. 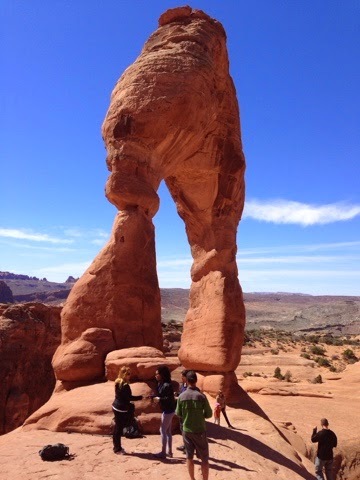 The first arch I will go to is Delicate Arch just over halfway into the park. 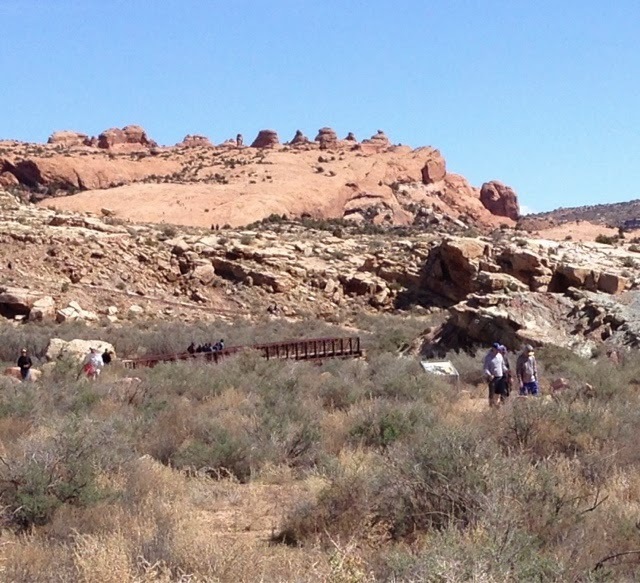 On the park's website there is a note at the top of the page saying that the parking lot for the trailhead to hike to Delivate Arch is full by 9:00. I decided I would not be deterred and take my chances, although there were many vehicles on the park roads giving credence to the warning. I went past many interesting formations to get here. The two parking lots for the Delicate Arch were full so I parked with others roadside but off pavement. Above is the beginning of the trail to the Delicate Arch long past the hill in the foreground. The hike is longer and steeper than I expected. At least there is plenty of people and scenery to watch/ see. 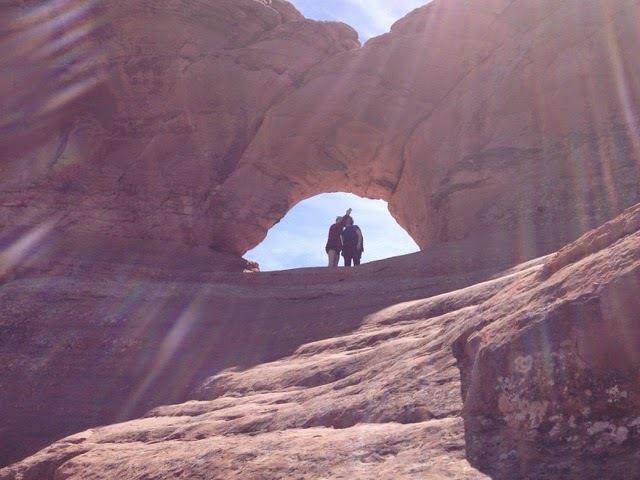 Before you get to Delicate Arch you arrive at this smaller arch above with people in it getting their picture taken. The climb is bare rock and quite steep. 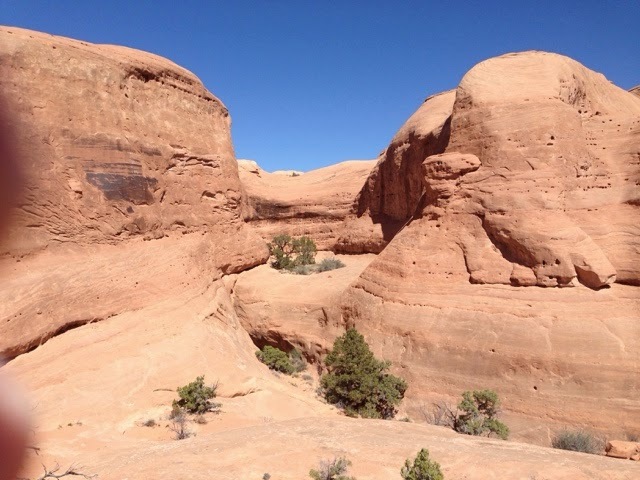 I continue on the trail around to get to Delacate Arch. I decide to climb around to get a closer look. I take a brief break and head back around to get a more interesting picture with the mountains with snow through the arch. I started a climb down the narrow path. Yes there is no railing. A bit unnerving but I wait for no one coming to head back down. 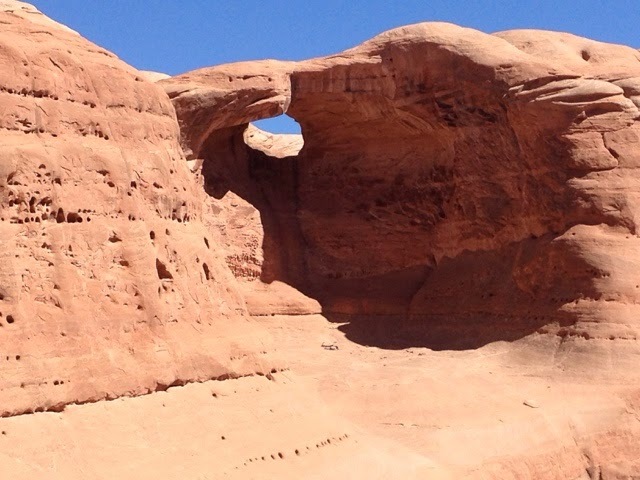 I go off trail to take a picture of another unnamed arch or in this case a hole in the rock. 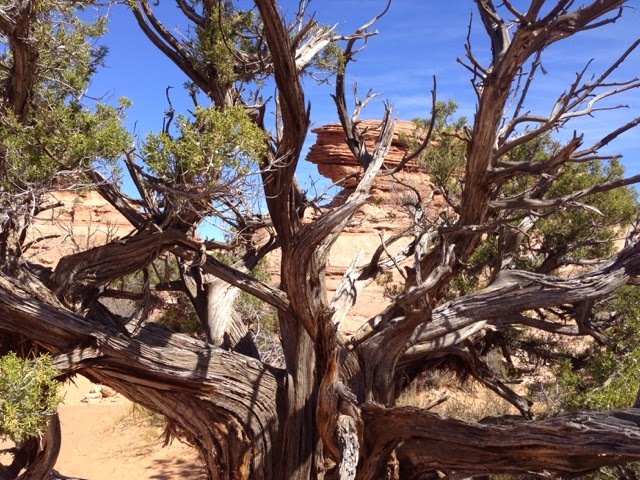 It's interesting how the swirling water carved out the formations do many years ago. 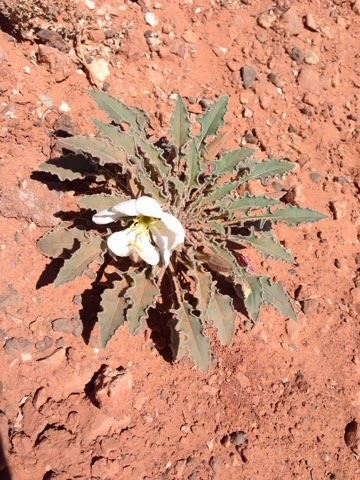 On the climb diwn and back to my Prius I did spot some desert flowers that were different than ones I have seen elsewhere. 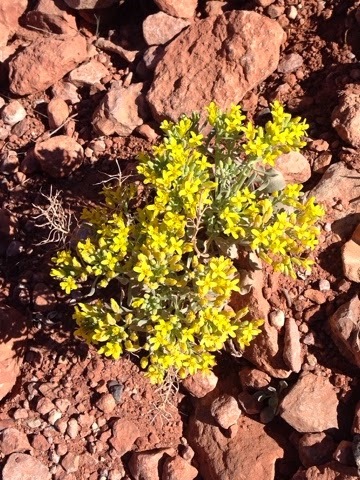 Couldn't pass up this yellow flower. We did pass trees from time to time too. Near the parking lot there are petroglyphs. 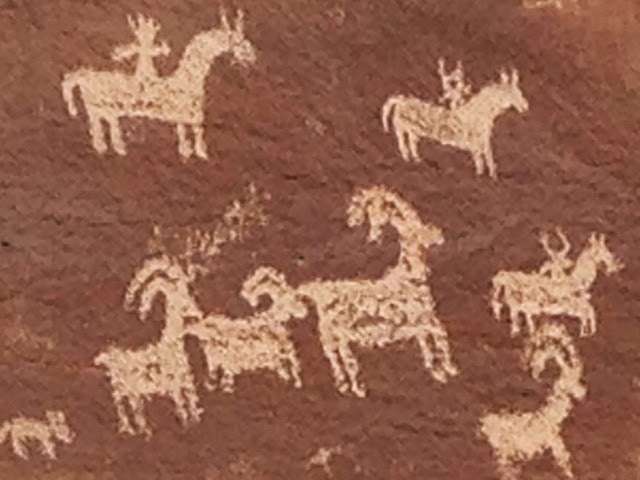 I like the horses and horned sheep and possibly a dog in the bottom left. 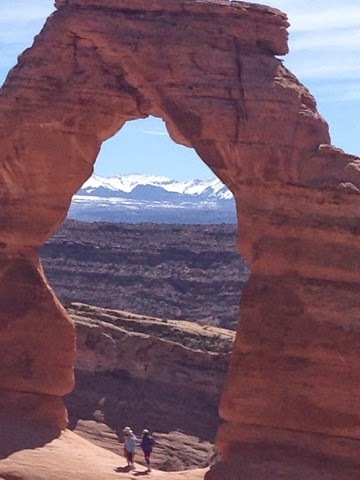 See Oart 2 of the Arches for Landscape Arch and Windows and Double Arch.